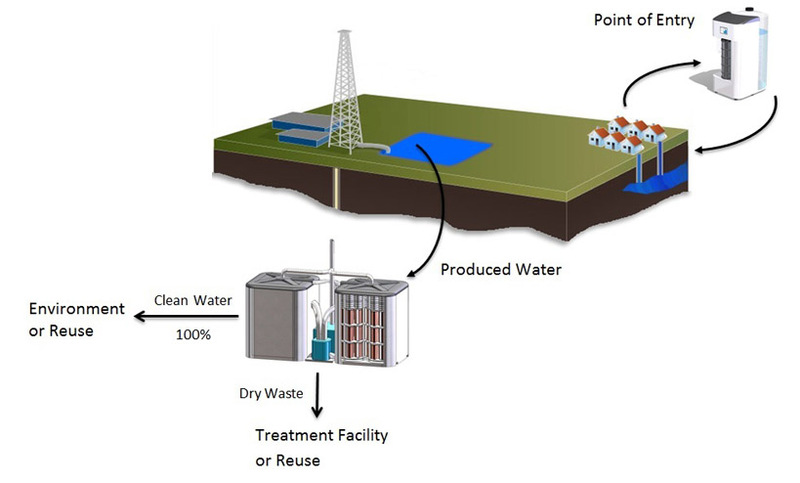 Produced water from drilling and operating oil and gas wells often needs to be cleaned sufficiently for safe disposal. Fracking of natural gas wells has increased the complexity and urgency of water reclamation. Distillation is the best technology to reclaim a high proportion of water and clean it to potable standards for local re-use or disposal without any harm to the environment, and allows the economic disposal or reclamation of chemicals from the concentrate. No other technology removes all contaminants in produced water effectively or cost efficiently. Oil in concentration of up to 600 parts per million is completely removed from produced water. Fracking occasionally poisons drinking water aquifers. Aquaback’s points of entry systems purify such contaminated water entering buildings, removing all chemicals, radioactivity and methane at a low cost, making drinking water perfectly safe and reliable.